Schoolwires, a State College, PA company, needed a lightweight solution and modern approach to development for their website and community management software solution named Centricity2™. Wijmo reduced the effort of building, maintaining, and customizing a complex system. An overall efficiency gain in having one library. Users can build their own application on top of the system. Education is a topic that garners attention. With their focus towards education, a State College, PA-based company, Schoolwires has developed a website and community management software solution named Centricity2™ that allows K-12 school districts to achieve a new level of success. 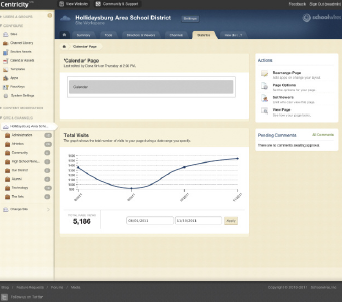 Currently over 8,000 schools across the United States are using Centricity2. This revolutionary website management solution is geared towards a large group of users, allowing teachers and other educators to create their own online community. Schoolwires provides the platform environment which allows its users to engage with the community, distribute the workload, and even build their own application on top of the system. This solution takes the meaning of playing in the Sandbox to a whole new level. The planning for Centricity2 began in 2008. At that time Schoolwires evaluated the .NET Framework and felt the “out-of-the-box” user interface controls were too dependent on the server side and needed a better client/presentation layer. Schoolwires’ development team began researching ways to move from .NET common controls to a lightweight AJAX solution paired with jQuery and looking for jQuery plugins and UI controls. Schoolwires looked to the community to find a solution for their user interface needs. Using Quora - an online question and answer community - the solution they found was a collection of over 30 jQuery UI Widgets named Wijmo. ComponentOne, the parent company to Wijmo, is a leading provider of data and UI controls for Window, Web, and Mobile development that has built a solid reputation for reliability for over 20 years. Additionally, the support and community built around ComponentOne offered Schoolwires the level of stability they needed. To ensure they did their due diligence, Schoolwires evaluated another vendor’s offering and found it to be heavy and too .NET centric. Wijmo offered the light footprint and more modern approach that Schoolwires was seeking. Schoolwires has end users working with their software from many different devices and computers. 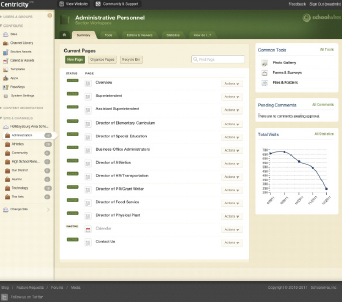 The powerful dashboards in Centricity2 need to work in every browser and on any device. Previously they had used Flash charts to create their interactive dashboard, but with Flash being limited to desktops, it was no longer an option. Schoolwires turned to Wijmo charts to get rich, interactive features and still work on mobile devices and older browsers. Over the next 6 months, Schoolwires completed their migration to Wijmo. The project was completed twice as quickly as they had expected. “The Wijmo widgets are so robust cover with our bandwidth,” said Coudriet. “The benefits were obvious quickly,” Coudriet added. Schoolwires realized an overall efficiency gain having one library and estimate they saved hundreds of hours given Wijmo reduced the effort of building, maintaining and customizing, and the complexities involved in the system. In addition to the time savings, Schoolwires was able to agilely build and release market-needed enhancements. I was really impressed with how the charts rendered identically in IE6 as they did in Chrome and Firefox. We were able to easily migrate our previously Flash dashboard to HTML5 and are now reaching more end users on more devices. Want to share a great story for our spotlight series? Email us at press@grapecity.com .